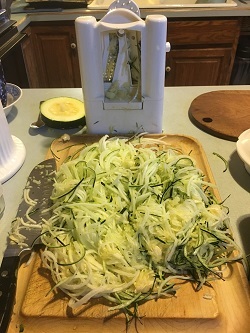 Spiralize the whole zucchini! Then chop it up with a butcher knife into smaller strands. 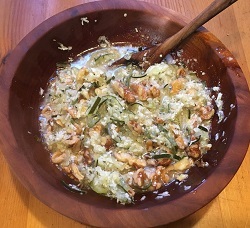 Add the zucchini and (nut) milk to a large skillet with a lid. Bring it to boiling and then lower to a simmer and cover. Stir occasionally, adding more liquid if needed, for about 20 minutes. 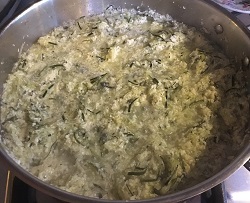 Once the zucchini starts to soften, add the hemp seeds coconut, and salt, and stir them in. Let it continue to simmer until it's a nice soft texture and the liquid is assimilated. Stir in any spices you would like, or enjoy it as a more savory breakfast bowl. Serve warm with healthy fats (coconut oil, flax oil) and nuts for more protein. If you need a little more sweet, add some currants, raisins, or fresh fruit. Have a bigger serving than you normally would--veggies don't keep you as full as long as grains do! If you're transitioning, try mixing this in with your normal breakfast grain to start. This sounds great! Could I substitute anything for hemp seeds? you could skip them altogether and just add more coconut. or try substituting maybe 1/4 cup flax or 2-3 T chia. the chia will add extra protein like hemp, but will soak up a lot of liquid, so you might need to add more to get it to the right texture… LMK what you create! Sounds delicious! However you mention serving with healthy fats like coconut oil for more protein. I need to point out that coconut oil is bad for the heart because it raises LDL cholesterol, the “bad” cholesterol. This is based on several long-term studies and verified by reputable sources, the Mayo Clinic being one. I’ve used coconut oil for my skin and love it. 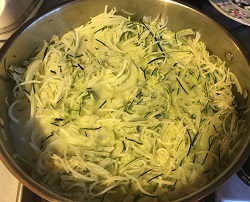 I started cooking with it because I believed it was good for me to do so, and have since stopped since I learned about how unhealthy it is for the heart . Hi Marlene, thanks for stopping by! There are different theories about cholesterol out there, but I follow the one that says that cholesterol, in and of itself, is not bad for you. You can read more here as a starting place: https://www.westonaprice.org/health-topics/modern-diseases/the-benefits-of-high-cholesterol/. Of course, everyone has to make their own decision.